Miki and Hiro can no longer deny their love for each other. Hiro is flouting the rules he is supposed to follow as a "Deliverer," feeling that it would be hypocritical of him to deny his love for Miki, considering the important role Deliverers play in relationships. Miki is head over heels, too, and when her nemesis, Reika, shows up to interfere once again, Miki fights back. She gives Reika a piece of her mind, and Hiro tells her to do her worst. If she wants to tell on them to his superiors, that is fine. Miki and Hiro decide to run away, rather than passively wait for disastrous consequences. They know in their hearts that their time together cannot last forever, that life - or his superiors - will catch up with them at some point, but they leave together all the same. Their love is strong, and it will be enough...won't it? Miki thinks so, until she overhears a conversation that leaves her reeling. I truly enjoyed this installment in the Miki Falls series, as I have the previous two. The books work very well because of the skillful way in which the images and text mesh, particularly as displayed within the specific layout of each page. The frames are broken up in such a way that they reflect the particular emotion within the scene. For example, when Miki and Hiro come across what appears to be an abandoned house in the woods, they turn a corner and see an old woman chopping wood. The frames are arranged in a zigzag pattern with jagged edges, which conveys both the sharp sound of the axe as well as the surprise that Miki and Hiro are feeling. In another, very emotionally charged scene between Miki and Hiro, the frames are stacked horizontally in such a way as to give quick glimpses first of one character's eyes, then the other's, which results in a cinematic effect of quick cuts from one face to the other as the emotions register. It's very effective. Miki and Hiro have taken the plunge in this one, and there's no turning back from here. I find it interesting that the seasons for the 4-volume series begin with spring and end with winter: it creates a sense of foreboding, as spring is typically associated with hope and renewal, and winter, of course, with death and endings. I have come to care very much about these characters, and I hope they will be able to overcome the considerable obstacles in their path and move toward a positive resolution in the final volume. 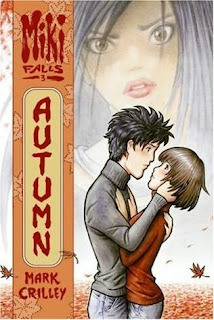 Biblio File: "Crilley has an interesting frame style...I first really noticed this with Autumn, where it really ties in well with the tenseness of the situation and Miki's emotional state at the time. I love it." This sounds good! Unfortunately the library only has the first two books and doesn't have the last two. That's so annoying! Kailana - That's too bad. There are only four of them, so you'd think they could shell out the cash for the last two. Have you tried asking? We try to be responsive to patron requests at my library - but of course the budget is always an issue. Hope you get to read the whole series soon! Thanks again for a wonderfully insightful review, Darla. I especially appreciate you making note of the page layouts and the interaction between the art and text--that became something of an obsession during the creation of this series, and it's great to hear that it had the desired effect. This does sound like a really interesting series the more of them that you review. The cover is lovely and I like your descriptions of the way the frames are laid out. It is interesting that it ends with Winter and as you say that is quite forboding. Fingers crossed!